The Columbia River Gorge offers visitors a variety of activities. It’s a New England tradition as the weather cools and the leaves begin to change. Leaf peepers come out in droves to watch Mother Nature change her clothes. Just a short drive east of Portland, the Columbia River cuts a dramatic 80-mile-long gorge through the Cascade Mountains — with cliffs and vineyards of Washington to the north and Oregon’s mountains and waterfalls — more than 90 of them — to the south. It’s a spectacular natural setting any time of the year, but come fall, when the cottonwoods, big-leaf maples, live oaks and Oregon ash show their colors, it is absolutely breathtaking. 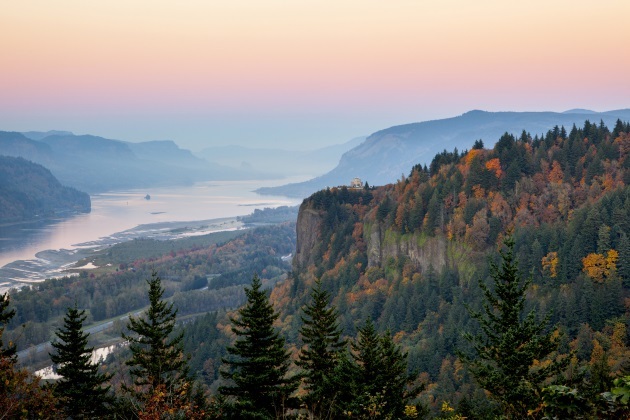 Visitors can take in the foliage while driving along the historic Columbia River Highway (an All-American Road), hiking a variety of trails, or rafting down the river. Late September to mid-October is usually the best time for fall foliage. For timely reports on foliage conditions go to www.oregonfallfoliage.wordpress.com. Aspens — ranging in color from bright yellow to deep orange — steal the show along this sublime 83-mile loop starting and ending in Taos, but maples, oaks, cottonwoods and beech chime in with colors of their own. The byway leads through the Sangre de Cristo Range, encircling 13,161-foot Wheeler Peak, New Mexico’s tallest peak, and the mesas and mountain vistas provide a unique southwestern perspective on autumn color. Foliage reports can be found at www.enchantedcircle.org. Door County — a narrow 70-mile-long finger of land jutting northward between Lake Michigan and Green Bay — is one of the most popular vacation destinations in the Midwest. A region rich in superlatives, it has more miles of coastline (298), more lighthouses (11) and more state parks (5) than any county in the United States. A drive along the peninsula on State Route 42 during fall foliage season, usually from late September through mid-October, offers one of the country’s most brilliant displays of color as mixed forests of maple, hickory, oak and birch make their seasonal turn. Peninsula State Park, a heavily forested 3,776-acre preserve, is a favorite with leaf-peepers who can hike or bike along an extensive network of wooded trails. Peak foliage periods vary from year to year, so check for the latest conditions at www.travelwisconsin.com/fall-color. 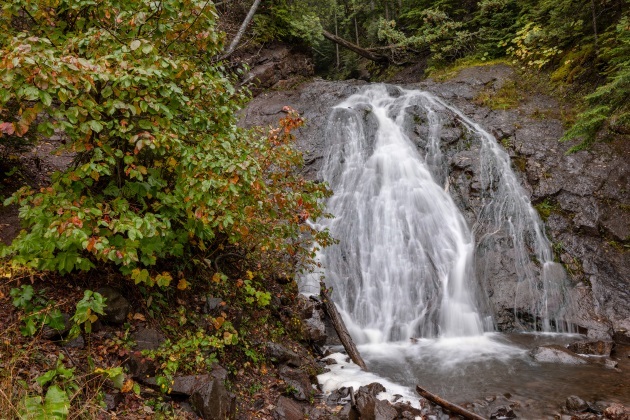 A waterfall on the Keweenaw Peninsula in Michigan. With the arrival of autumn, Michigan’s entire Upper Peninsula blazes with fiery colors across the region’s 8.8 million acres of forest — the largest forest system in the eastern U.S.
Foliage aficionados suggest a drive up Route 41 to the tip of the Keweenaw Peninsula, where dense stands of maple, birch, beech, aspen, oak, tamarack and sycamore provide plenty of eye candy. The best time to take in fall colors here is typically from mid-September to mid-October. For foliage updates, go to www.uptravel.com/fall-color-reports. The Delaware Water Gap is on the eastern edge of the Poconos. 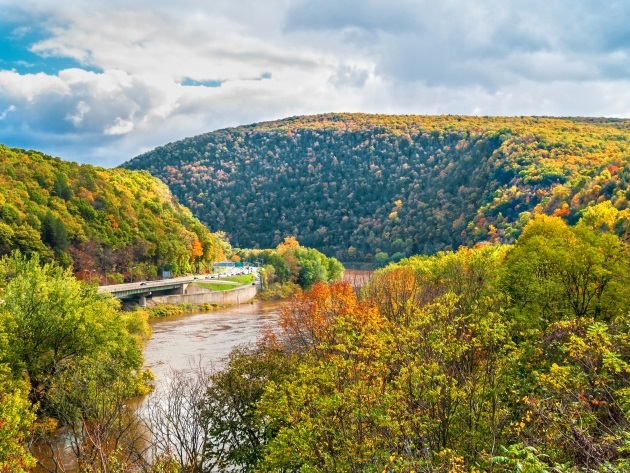 Best known for honeymoon resorts sporting heart-shaped hot tubs, round beds and ceiling mirrors, the Poconos don’t get the attention they deserve as the top location in the eastern U.S. (outside of New England) for vibrant fall foliage. The autumnal romance with nature here in these low-lying mountains stems from an extraordinary mix of more than 127 varieties of trees, shrubs and plants. The list of deciduous trees is a long one — with beech, birch, oak, maple, ash, elm and poplar being the most common. Three distinct color zones — Northern, Central and Southern — offer leaf watchers the opportunity to catch peak colors at three different times during the fall foliage season, which normally extends from mid-September through October. Foliage forecasts are available weekly from Sept. 6 until the end of October at www.poconomountains.com/seasons/fall. Situated near Birmingham, Oak Mountain State Park spans 9,940 acres of gentle mountains and forest. It is Alabama’s largest and most visited state park, and is well known throughout the Southeast for its eye-catching annual display of fall colors. In addition to the park’s namesake oaks, leaf peepers are treated to a vivid palette of colors — yellow poplars, scarlet dogwoods, orange maples and golden hickories. The Treetop Nature Trail, an elevated boardwalk winding through a woodland valley, affords fine views of the foliage, as do the park’s more than 50 miles of hiking and mountain biking trails. Peak color here is usually from mid-October through early November – but check for color updates at the park website, www.alapark.com/oak-mountain-state-park.